Our lodging can accommodate guests who are traveling alone to Encinitas or groups of up to six people. Each of our suites is spacious enough to comfortably sleep you and your guests with a sofa bed in each. You will fall in love with the Eco Memory Foam mattresses that are wrapped in 5,000 thread-count linens. Our main priority is the wellness of our guests and we make that a point by placing bath salts and a Spa Aromatherapy diffuser in each suite. Each suite has been designed with your wellness in mind, from the property’s architecture to the hand-picked decor in each suite. Our accommodations set us apart from any other lodging options in Encinitas. Our suites have private decks that overlook the ocean, allowing you to meditate and relax while feeling the ocean breeze. In our rooms, you'll find a microwave, fridge and hot water machine. You'll also love waking up to a Healthy Start Breakfast Basket, a delicious perk all of our guests get to enjoy! These baskets include items that accommodate healthy lifestyles including gluten-free, vegan, and vegetarian options. We also offer freshly made treats throughout the day in the lobby. Our lodging can accommodate guests who are traveling alone to Encinitas or groups of up to six people. 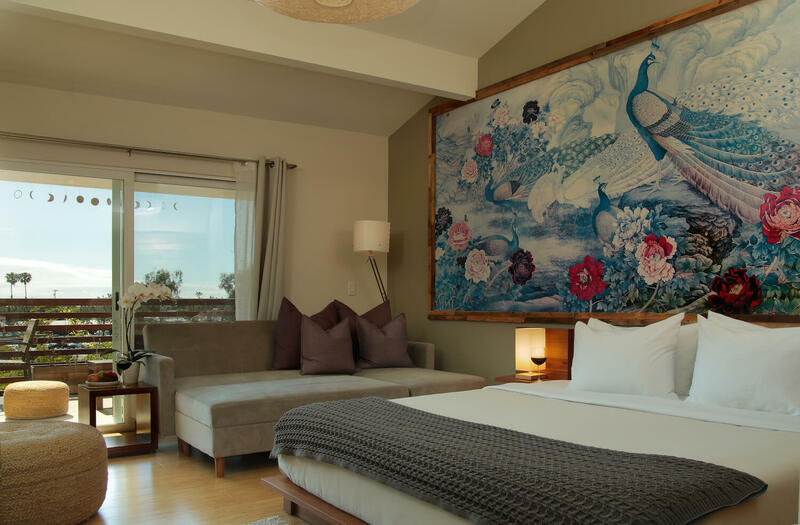 Each of our suites is spacious enough to comfortably sleep you and your guests with a sofa bed in each. You will fall in love with the Eco Memory Foam mattresses that are wrapped in 5,000 thread-count linens. Our main priority is the wellness of our guests and we make that a point by placing bath salts and a Spa Aromatherapy diffuser in each suite. View all our lodging options to begin planning your relaxation retreat to Encinitas today. We often call our Moonlight Courtyard Suite the Sweet Bay because of its elegance and brightness. The suite has a Queen size bed along with a twin sofa bed that can comfortably fit up to 3 guests. This suite features a front patio entrance with high ceilings. For ultimate relaxation, there is a large private bathroom that has a combination shower stall with a large deep soaking tub. Guests are greeted upon arrival with a freshly brewed cup of organic tea and fresh fruit, as well as the soothing scents and sounds from the in-room aromatherapy diffuser and sound-therapy machine. 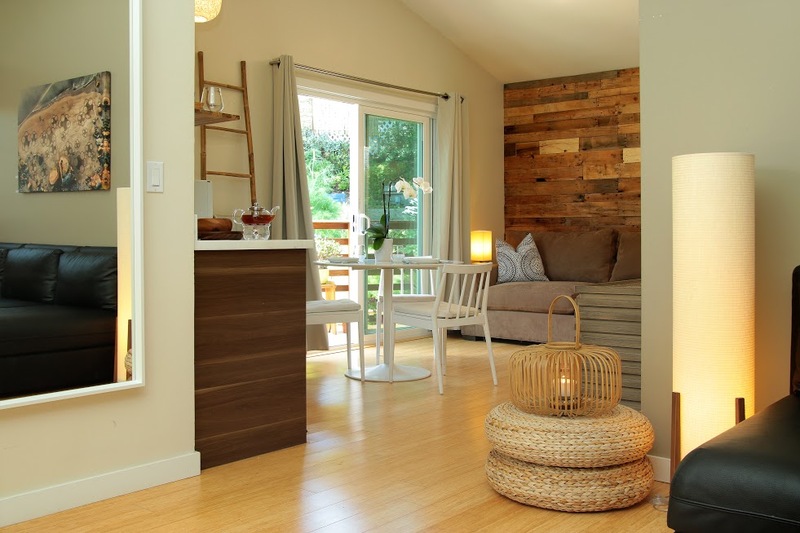 The Moonlight Garden Suites are modern, elegant studio suites. Each has a King bed and a full sofa bed that can accommodate up to 4 guests. The suites have their own private decks connected to an outdoor garden, yoga deck, and meditation space on the ground/ lower level. 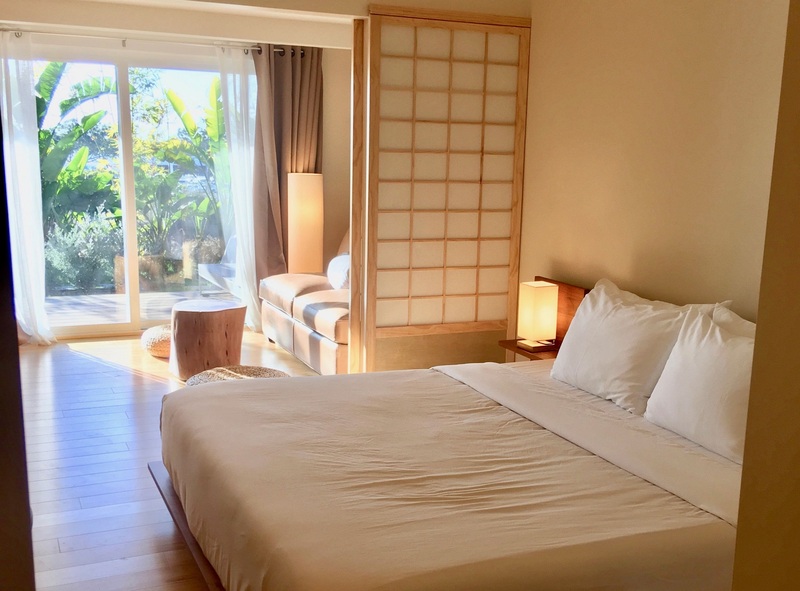 The partial ocean view through the bamboo plants creates a perfect environment for those who are seeking tranquility and relaxation while feeling the breeze of the ocean. Our Moonlight Ocean Suite is our most exclusive and romantic suite that has a double height ceiling and private deck looking out to an ocean view. The spacious bathroom has a stand-alone bathtub and a separate walk-in shower. This suite can accommodate up to 4 people or 2 adults with 3 kids with a King bed and one king size sofa bed. Not only is this suite spacious, but it’s also luxurious with unique decor in every part of the suite. 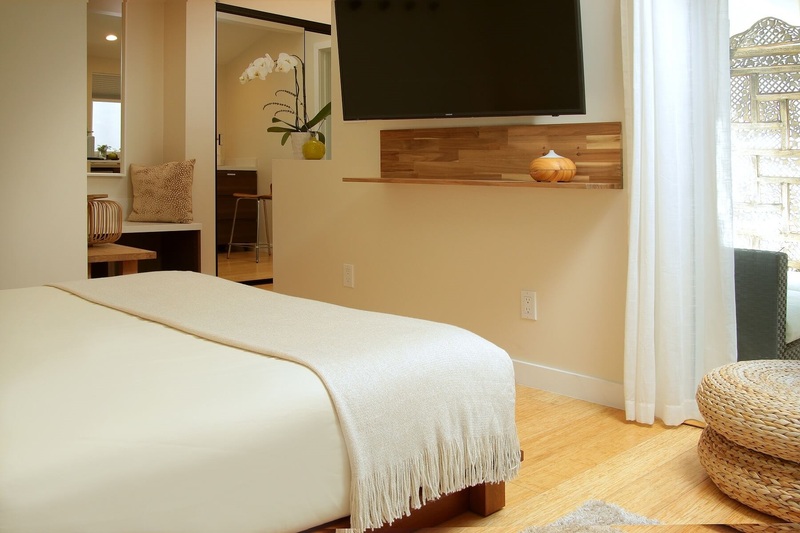 The Full Moon One-Bedroom Suite is a beautiful, modern one bedroom suite that is our most spacious suite. It has a King bed in a private bedroom with two queen sofa beds in the living room and dining room area that can accommodate a family or groups of up to 6 people. With its own secluded entrance, you step into a private living and dining area that includes a lovely deck and kitchenette overlooking our biodynamic vegetable garden.